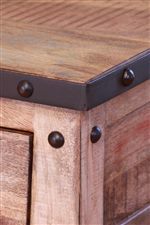 Rustic style is created on this dresser with iron drawer pulls as well as iron feet and nailhead trim. This dresser boasts a beautiful multi-colored wood finish while also providing you with ample storage space. Use both size drawers for holding clothing, bedding and other personal items. The Maya Rustic Style Dresser with 7 Storage Drawers by International Furniture Direct at Sparks HomeStore & Home Furnishings Direct in the Thatcher, Cottonwood, Safford, Sedona, Morenci, Arizona area. Product availability may vary. Contact us for the most current availability on this product. 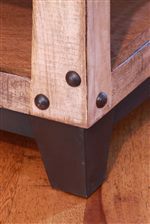 The Maya collection is a great option if you are looking for Relaxed Vintage Contemporary furniture in the Thatcher, Cottonwood, Safford, Sedona, Morenci, Arizona area. Browse other items in the Maya collection from Sparks HomeStore & Home Furnishings Direct in the Thatcher, Cottonwood, Safford, Sedona, Morenci, Arizona area.